The concentrating-solar startup, which uses mirrors and lenses to concentrate the sunlight onto its panels, has installed 200 kilowatts of concentrating PV so far and plans to complete the 500-kilowatt system in the next month. Concentrating-solar startup SolFocus has completed the first phase of its first commercial project, the company said Wednesday. The Mountain View, Calif., company said it has installed 200 kilowatts of its technology, which uses lenses and curved mirrors to concentrate sunlight onto small solar cells, for the Institute of Concentration Photovoltaic Systems in Puertollano, Spain. The company plans to finish the project by building an additional 300-kilowatt array over the next month. The project represents a milestone for SolFocus. While many companies are developing concentrating photovoltaics -- and a number of demonstration plants have popped up -- this is one of the technology's first commercial plants. SolFocus declined to give the cost of the project or disclose other terms of its contract with the institute, also known as ISFOC. 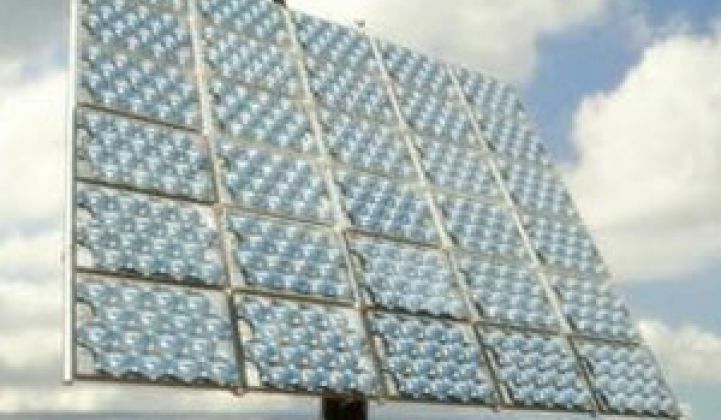 The Spanish government created ISFOC in 2006 in partnership with the regional government of Castilla-La Mancha to explore different types of concentrating-PV technology. Working with the Universidad Politecnica de Madrid, the ISFOC is working with several concentrating-solar companies to build power plants with a total 3-megawatt capacity at various towns in Castilla-La Mancha. ISFOC has contracted with seven companies to carry out the first 1.7 megawatts of the 3-megawatt project. Aside from SolFocus, the companies are Isofoton in Spain, Concentrix Solar in Germany, Emcore in the United States, Arima Eco in Taiwan, Sol3g in Spain and Concentracion Solar La Mancha in Spain. Some of SolFocus' other competitors include Sunrgi and Soliant Energy, as well as Covalent Solar, a company spinning off from the Massachusetts Institute of Technology (see Dyeing for More Solar Power). SolFocus, founded in 2005, had raised a total of $107.2 million by November and is reportedly working to raise approximately $75 million more (see SolFocus Snags More Cash, More Chip Companies Turn to Solar and Green Light post).